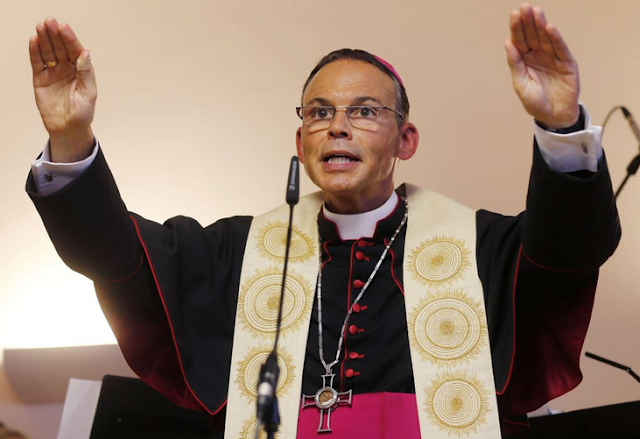 Franz-Peter Tebartz-van Elst a Catholic Bishop from Germany has recently landed in hot water for alleged massive cost over-runs in the building of a luxury residence and office complex as well as lying under oath. Known as the "Bling of Bishop" and the "Luxury Bishop" he has been removed from his diocese in Limburg by Pope Francis while an audit and an investigation and regarding cost these excessive costs are conducted. In the above image Franz-Peter Tebartz-van Elst is shown in a high, bilateral, palms-down configuration. Palm-down body language is authoritative, assertive and alpha - and it's universally negatively received by audiences. As with all alpha body language, it should be used sparingly - essentially choreographed into a presentation - lest it backfires. Those in leadership positions however almost always over-use alpha body language - thus destroying rapport and repelling peers, subordinates ... and superiors. This particular example of the bling bishop is significantly dialed-up. Its bilateral nature significantly elevates his alpha signal. In addition, the higher the hands are held - the more the authoritativeness is further up-regulated. Moreover, the bishop's fingers and thumbs are closed and parallel form - which amplifies the dominant emotional tone even further. This palms-down nonverbal is extremely hyper-alpha and will alienate others. Religious figures are not exempt from this phenomenon. Those in power will tend to display a much higher alpha body language signal density. Studies suggest that people in power often also tend to have less empathy. So if you want to seek out those with empathy - beware of those who use an excess of alpha nonverbals. Think of another German leader from the 1930's and 40's and you will have a clearer illustration of this principle.